The smell of freshly baked bread is one of the most powerful aromas to the human nose. 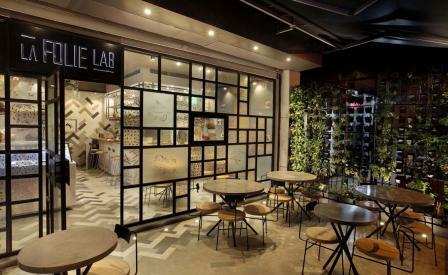 At La Folie Lab, a Mumbai-based patisserie, owner and chef Sanjana Patel has taken this concept to whole new level, delicately scenting the space with a bespoke fragrance via a distillation apparatus that diffuses an essence throughout. The idea is to make visitors hyper-aware of the food they are about to consume, and of the relationship scent plays in this experience. Such a detail is symbolic of Patel’s overall approach to La Folie Lab, where a decidedly experimental approach to baking has been applied. Designed to house a large open kitchen arranged in a format similar to that of a bar, seating is configured so that guests may observe the chefs in action as they produce a menu that includes freshly baked goods in the morning, light, savoury meals, and desserts and ice creams where components such as liquid nitrogen imbue dishes with a touch of theatrical drama. Integral to the design of the space, which was conceived by local designer Rooshad Shroff in collaboration with Patel, is the incorporation of the ingredients used on the menu into the interiors. Vertical gardens that buttress both sides of the patisserie grow the fresh herbs and edible flowers used by the chefs inside, while guests are welcomed via a resin tiled façade that sandwiches ingredients such as Tahitian vanilla pods, candied oranges and rosemary. Inside, custom-made concrete herringbone tiles run through the floors to the walls, smoothly merging the all elements of the clean and modern black, white and grey palette. The result is a warm and inviting space that belies its moniker in the best way possible.